Rep. 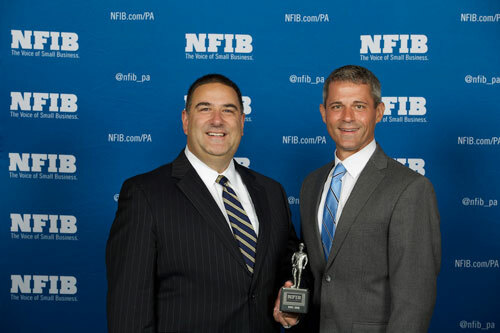 Rob Kauffman recently received the Guardian of Small Business Award from the National Federation of Independent Business (NFIB). Presenting the award is Kevin Shivers, NFIB executive state director. The Guardian of Small Business awards are given to legislators who consistently vote favorably on key small business issues that are among the highest priorities of NFIB’s small business agenda. Kauffman is one of only 25 members of the Pennsylvania House of Representatives to be recognized with the designation who had a 100 percent pro-small business voting record. To be recognized with the award, members need to have at least a 75 percent pro-small business voting record.